One of the world’s foremost authorities on structural security agrees to take on one last job: breaking out of an ultra-secret, high-tech facility called “The Tomb.” Deceived and wrongly imprisoned, Ray Breslin (Sylvester Stallone) must recruit fellow inmate Emil Rottmayer (Arnold Schwarzenegger) to help devise a daring, nearly impossible plan to escape from the most protected and fortified prison ever built. 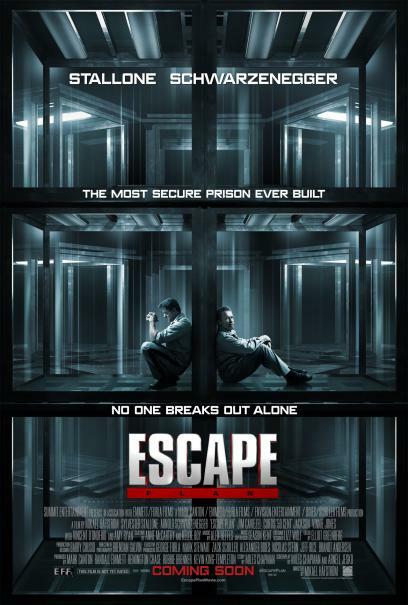 “Escape Plan” is the first pairing of action legends Sylvester Stallone and Arnold Schwarzenegger in leading roles, and co-stars Jim Caviezel, Curtis “50 Cent” Jackson, Vinnie Jones, Vincent D’Onofrio and Amy Ryan. I was so prepared not to like “Escape Plan” thinking it would be another run of the mill Stallone action movie. I went in with very low expectations, not knowing anything of the plot. But surprisingly, this film turned out to be very engaging and fun to watch after all. I will not be putting a detailed synopsis for you to be able to enjoy this movie fully as well. Ray Breslin (Sylvester Stallone) is a Houdini of jails, having the ability to escape even the highest of high security enclosures. He finds himself locked up in an unofficial facility whose problematic inmates are meant to “disappear”. In the advanced, high tech and isolated prison, Breslin’s escape skills are put to the ultimate test. Sylvester Stallone still delivers his lines as garbled as ever, but he looks good for his age, and has not lost his charisma as an action star. He managed to be quite credible in playing such an incredibly-skilled individual. We are ready to suspend disbelief and accept that he can do the impossible. Hey, that is Stallone on that screen! Arnold Schwarzenegger plays a German inmate named Rottmeyer, who befriends Breslin. Arnie plays it light here, with his acting so typically awkward and actually funny, but we know and love him in this tongue-in-cheek style of his. Jim Caviezel is intense as Hobbes, the warden of this special prison, as well as its proud designer. He will go to all extremes to prove that his prison is escape-proof. His career seemed to have taken a dip after “Passion of the Christ” and that is unbelievable after the limits he pushed with that memorably emotional performance. He is very good here despite being in a rather one-dimensional antagonist role. It was very good to see Sam Neill on screen again, also after what seems to be a long absence. He plays the prison physician here faced with a moral dilemma. The story telling by Swedish-born director Mikael Håfström is well-paced and actually quite exciting. The set design of the prison was very high- tech, and well thought of. That version of solitary confinement was harsh! The escape techniques seemed logically planned and thrillingly executed. The revelation scenes are very well-staged and that is only how far I’m going to describe them so you won’t be spoiled with the many surprises this film has in store for you. Posted in Action, Thriller. Tagged Download Escape Plan Film 2013 Complete, Escape Plan Battle of the Year: The Dream Teamovies to download, Escape Plan complete movie part 1 of 9, Escape Plan complete movie part 2, Escape Plan complete movie part 2 10, Escape Plan download free movies, Escape Plan download movie, Escape Plan download movies, Escape Plan ending, Escape Plan film online, Escape Plan free download full movie, Escape Plan free full movie, Escape Plan free movie download, Escape Plan free movie part 1, Escape Plan free movie part 1 12, Escape Plan free movies, Escape Plan free movies download, Escape Plan free movies online, Escape Plan free movies online without downloading, Escape Plan free streaming, Escape Plan full movie, Escape Plan full movie download, Escape Plan full movie free download, Escape Plan full movie free online, Escape Plan full movie online, Escape Plan hd, Escape Plan hd movie, Escape Plan hd movie part.1, Escape Plan hd trailer, Escape Plan hd video, Escape Plan movie clip, Escape Plan movie clips, Escape Plan movie download, Escape Plan movie ending, Escape Plan movie trailer, Escape Plan movie watch online, Escape Plan movies online, Escape Plan online movie, Escape Plan online stream, Escape Plan online video, Escape Plan online videos, Escape Plan part 1, Escape Plan part 1 hd full movie, Escape Plan trailer, Escape Plan videos online, full movie Escape Plan, part 1 Escape Plan, Streaming Escape Plan Full Movie Online English Subtitle, watch Escape Plan, watch Escape Plan a movie, watch Escape Plan free, watch Escape Plan free movies, watch Escape Plan free movies online without downloading, watch Escape Plan Free Online, watch Escape Plan full movie, watch Escape Plan movie, watch Escape Plan movie online, watch Escape Plan Online, watch Escape Plan online free, watch Escape Plan online full movie, watch Escape Plan online movie, watch Escape Plan Without Survey, watch online Escape Plan in hindi.